African Union and Italy hold substantive talks on strategic cooperation. Addis Ababa, Ethiopia, 12th October 2018; The African Union Commission Deputy Chairperson, Amb. Kwesi Quartey, met with the Prime Minister of the Republic of Italy, Mr. Giuseppe Conte, during which they discussed a raft of measures to enhance collaboration and support in areas of migration, development cooperation and peace and security in Africa. The maiden visit of the Prime Minister to the African Union headquarters, provided an opportunity for the two leaders to affirm their commitment to deepen cooperation and enhance synergy in advancing efforts for stability and sustainable economic development, with emphasis on the nexus between peace and security and development. On the issue of migration, the leaders discussed the need for an integrated structural approach. The Prime Minister spoke of Italy’s strategy submitted to the European Council earlier this year, which moves away from ad hoc treatment of the issue and seeks to mobilize and promote integrated solutions that include investment in source and transit countries, as well as burden sharing among EU countries to also ensure the safety of migrants and their meaningful socio-economic integration in receiving countries. The Deputy Chairperson, on his part, restated the African Union’s commitment to further advance the implementation of the AU Migration Policy which articulates comprehensive and integrated policy guidelines to its Member States and Regional Economic Communities, on areas of labour migration; border management; irregular migration; forced displacement; rights of migrants; internal migration; migration data management; migration and development; and inter-State co-operation and partnerships. The Prime Minister underscored the important role played by the African Union, and expressed Italy’s interest in cooperating with the AU on a broader scope of issues. On the fragile situation in Libya, the leaders exchanged views on the need to encourage and support Libyan leaders and stakeholders towards inclusive political dialogue, and as necessary, provide mediation and reconciliation support. Acknowledging the complex political, security and legislative challenges, they noted the need to create an enabling environment for a successful electoral process and a peaceful completion of the ongoing transition in the northern African country. Italy has been a supporter of the African Union’s peace and security programmes through the Italy – Africa Peace Facility, and recently partnered with the African Union Commission to create an enabling policy environment and necessary skills for wider application of renewable energy. 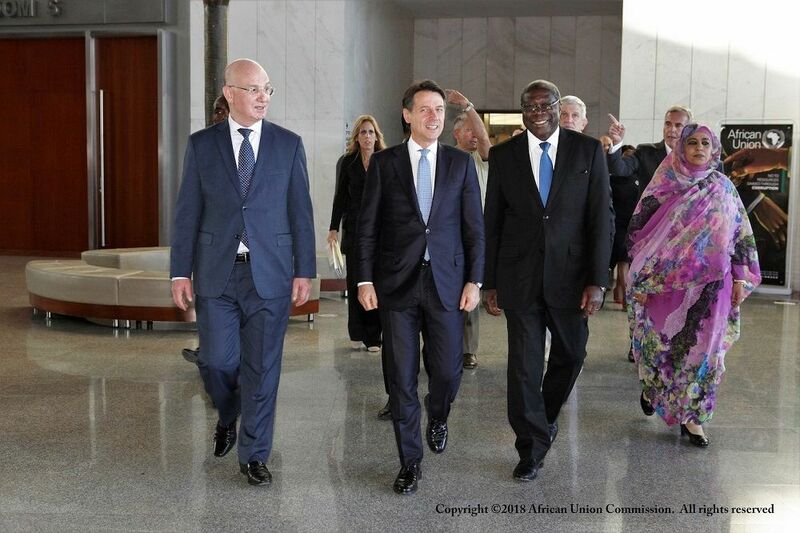 This year, Italy established a dedicated mission to the African Union. The Prime Minister’s visit to the African Union is part of his trip to Ethiopia and Eritrea to offer Italy’s support to the recently signed the peace deal between the two states. The Deputy Chairperson was accompanied by the Commissioner of Peace and Security, Amb. Smail Chergui and the Commissioner of Social Affairs, Amira Elfadil, in the discussions with the Italian delegation.